As, what one of this comic’s creators referred to me as, a Lumber-Jane Hippie, I will admit that at first I was intrigued and entertained by this title, but I did not ‘get’ it. I had no idea what fired pies were and I don’t drink sweet tea. 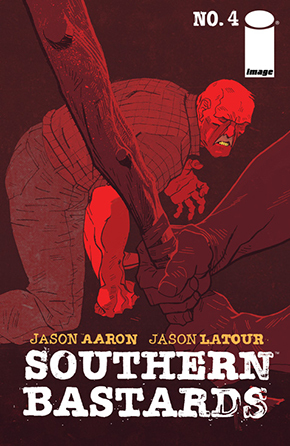 So not only is this title teaching me something with each new issue, it’s helping me understand what the culture the South really is. There are more layers and complications than the caricatures that are portrayed on television and movies. The South is deep seeded in history, tradition, stubborn pride, unapologetic brutality, a language seemingly all its own, and some of the most colorful cast of realistic characters you can find. Every Southerner I know who has read this book have said they know people like the very ones written on this book. The issue starts out with Earl leaving another heartfelt voicemail to a character who has remained unknown since the beginning of the series. The Bastards of the town continue to try to break him and as a reluctant, would-be hero, his sense of ethics and honor set him off to confront Coach Boss to make right what he feels should be done. Coach Boss’s vanity, at the expense of others, makes him a cold authoritative figure. Earl fights his way through the men waiting for him at the town’s BBQ joint, until he is face to face with the town’s kingpin. They throw insults at each other, digging up their history, until the two break out in a fight in front of the whole town. It is quite an emotional scene as everyone bears witness to Earl being beat to death by his own stick. The visuals of crowd scenes are especially strong this issue. Each character on the panel has their own personality, as if you could craft a backstory for each one and the nuanced details give them a realistic feel. Latour’s colors also make this title stand out visually. The palette evokes the feeling of the unforgiving heat of summer in the South. Even the flashback sequences are colored in a non-typical way in vivid reds, which makes sense within these pages, but wouldn’t quite work in any other application. You feel like you are actually experiencing Earl’s own memories as they’re cut with a violent fight scene. The gridded panels flow quite well, telling the story effectively without words. Aaron’s dialogue puts you among these people. It’s refreshing to get an accurate depiction of the drawl and cadence of how the people communicate, as opposed to the fake accents you find on TV shows, like True Blood. The issue ends on one hell of a cliffhanger, one that the creators have said they have devilishly saying they were planning from the beginning.